Apple Product Rumors: Essential or a Complete Waste of Time? 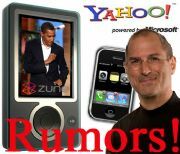 Rumors have always been a part of the Apple community but it seems that recently they've taken on a new intensity with rumors about everything from the iPhone to Steve Jobs' health popping up on an almost daily basis. Are these rumors still just part of the fun of Apple or does something need to be done? I have a love-hate relationship with Apple rumors. Sure, it can be fun to speculate on what Apple's doing next, but--despite my learned colleague David Daw's silly fascination with the subject discussed later in this article--at some point over the past few years, Apple rumors went from being fun to being obnoxious. Here's why. David, I hope you learn something here. Personally, I don't feel I need to know what Apple is up to every minute of the day--but that's just me. While, yes, it might be good to pinpoint when a new product is coming out, rumors by their very nature are unreliable (more on that in a bit). And oftentimes, rumors are based on patent applications and on circumstantial evidence, which makes them less accurate, and therefore less useful than you might think. Speaking as a geek and a gadget fan, it's always fun when a company announces something new and cool without warning. Apple rumors spoil the surprise. And sometimes, those rumors get so fanciful and "out there" that when Apple does announce something, there's often a general feeling of being let down. David, let's take the original iPad announcement. Remember all the hype and speculation surrounding it? Remember how it was expected to blow our minds? Then remember how it was derided as a big iPod Touch? Would we have been as disappointed at first if it wasn't so overhyped by rumors beforehand? I don't think so. The iPad 2 is another example. Prior to the official announcement, rumors had it that the iPad 2 would have a "retina display" and an SD card slot. The iPad 2 was instead an incremental update to the hardware, with no significant hardware feature additions. Yawn.
" iPhone 5 To Have NFC, Says Person Who Knows A Man With A Friend Who Works At Apple "
Speaking of the iPhone 5, it may come out in late June. Unless it comes out this fall. But it may not come until next year. The fact of the matter, my dear David, is that none of us really knows who these "insider sources" are, and how reliable they are, so that makes it hard to put stock into any of the rumors. Unfortunately, all too often, rumors end up being reported as fact--or as something that'll almost assuredly happen, as evidenced by claims made by "extremely reliable" sources. So, while a small part of me likes following the rumor mill, I wouldn't be too upset if the whole concept would just completely dry up and blow away. Surely David can see the logic here? Next: Staff Editor David Daw explains to Nick why Apple rumors should stick around.